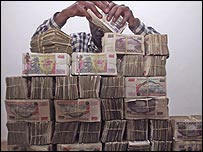 Photo: BBC Money is nearly worthless in Zimbabwe due to inflation of 1200 percent per year, the highest in the world. The government’s plan to exchange new money for old has created further problems. Zimbabwean authorities have seized more than $50m worth of old banknotes at roadblocks and border posts in a crackdown on money launderers.